Even at five hundred yards’ distance, we spotted Dee Tocqueville glowing fluorescent at the tricky bend in Francis Rd where it meets Newport Rd outside the school. 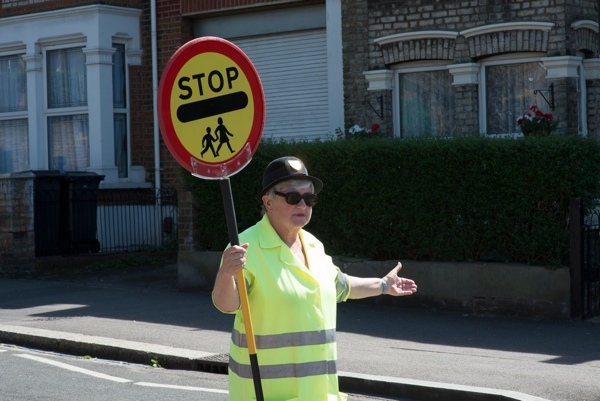 A lethal configuration that could prove a recipe for carnage and disaster, you might think – if it were not for the benign presence of Dee, wielding her lollipop with imperial authority and ensuring that road safety always prevails. 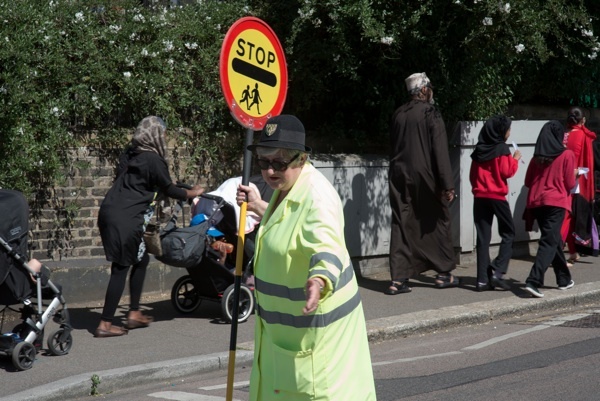 “After all these years, I’m part and parcel of the street furniture,” she confessed to me coyly, before stepping forward purposefully onto the crossing, fixing her eyes upon the windscreen of an approaching car and extending her left hand in a significant gesture honed over decades. 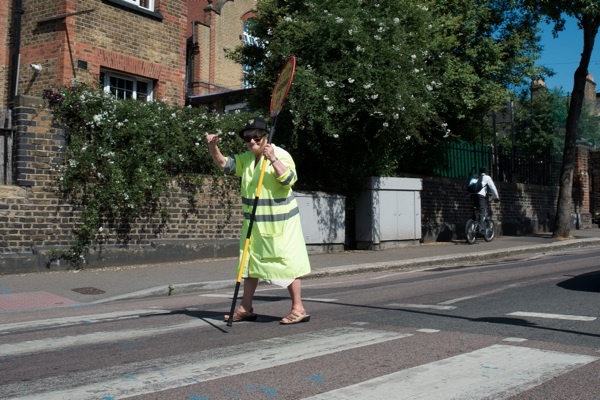 Sure enough, at the sight of her imperial sceptre and dazzling fluorescent robes the driver acquiesced to Dee’s command. 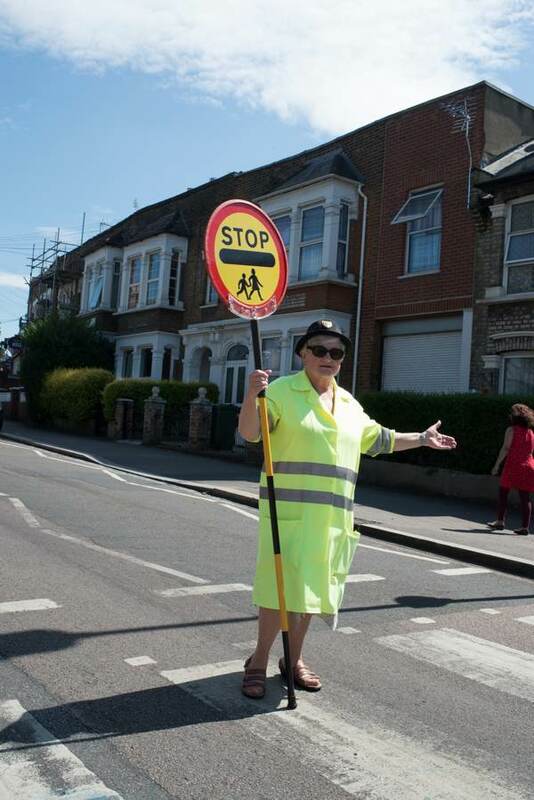 We had arrived at three, just before school came out and, over the next half hour, we witnessed a surge of traffic that coincided with the raggle-taggle procession of pupils and their mothers straggling over the crossing, all guaranteed safe passage by Dee. In the midst of this, greetings were exchanged between everyone that crossed and Dee. And once each posse had made it safely to the opposite kerb, Dee retreated with a regal wave to the drivers who had been waiting. 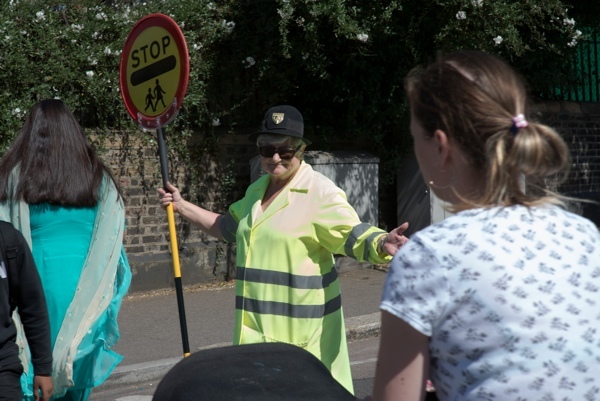 Just occasionally, Dee altered the tone of her voice, instructing over-excited children at the opposite kerb to “Wait there please!” while she made sure the way was clear. Once, a car pulled away over the crossing when the children had passed but before they had reached the other side of the road, incurring Dee’s ire. “They’re impatient, aren’t they?” she commented to me, gently shaking her head in sage disappointment at human failing. 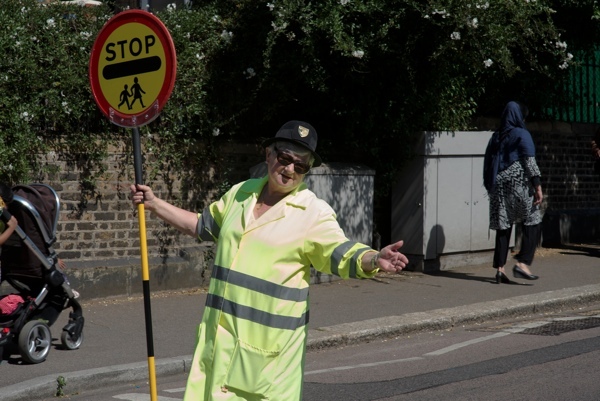 Complementing her innate moral authority, Dee is the most self-effacing person you could hope to meet.“It gives you a reason to get up in the morning, and you meet lots of people and make lots of friends,” she informed me simply, when I asked her what she got out of being a Lollipop Lady. 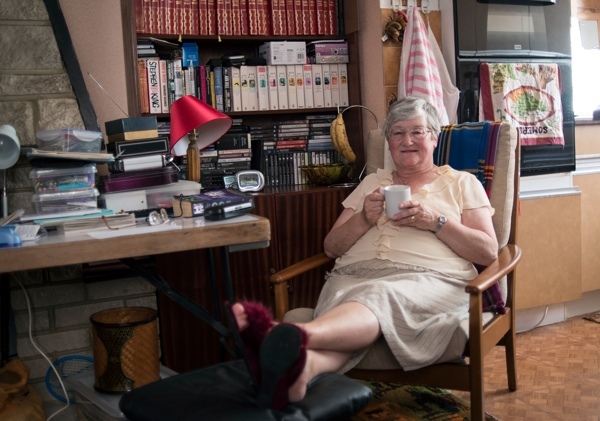 Dee was born and grew up fifty yards away in Francis Rd and attended Newport Rd School as a pupil herself, crossing the road every day, until she crossed it for good when she married a man who lived a hundred yards down Newport Rd. Thus it has been a life passed in the vicinity and, when Dee stands upon the crossing, she presides at the centre of her personal universe.“After all these years I’ve been seeing children across the road, I have seen generations pass before me – children and their children and grandchildren. 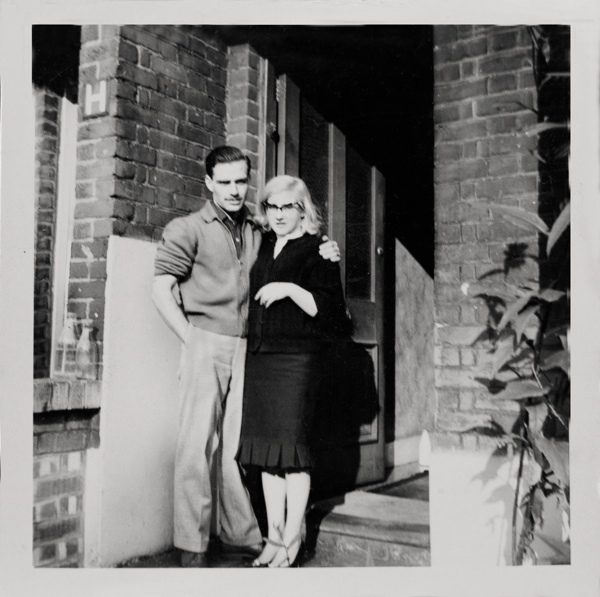 The grandparents remember me and they come back and say, ‘You still here?’” she confided to me fondly. At three-thirty precisely, the tumult ceased and the road emptied of cars and pedestrians once everyone had gone home for tea. Completing her day’s work Dee stowed the lollipop in its secret home overnight and we accompanied her down Newport Rd to an immaculately-appointed villa where hollyhocks bloomed in the front garden. “I have rheumatism in my right hand where the rain runs down the pole and it’s unfortunate where I have to stand because the sun is in my eyes,” she revealed with stoic indifference, taking off her dark glasses once we had reached the comfort of her private den and she had put her feet up, before adding, “A lot of Boroughs are doing away with Lollipop Ladies, it’s a bad thing.” In the peace of her own home, Dee sighed to herself. The shelves were lined with books, evidence of Dee’s passion for reading and a table was covered with paraphernalia for making greetings cards, Dee’s hobby. 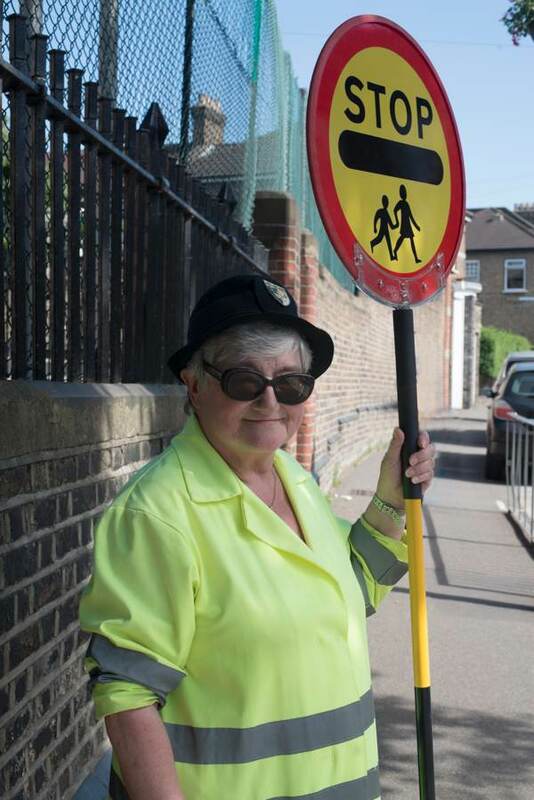 “People don’t recognise me without my uniform,” she declared with a twinkle in her eye, introducing a disclosure,“every Thursday, I go up to Leyton to a cafe with armchairs, and I sit there and read my book for an hour with a cup of coffee – that’s my treat.” Such is the modest secret life of the Lollipop Lady. 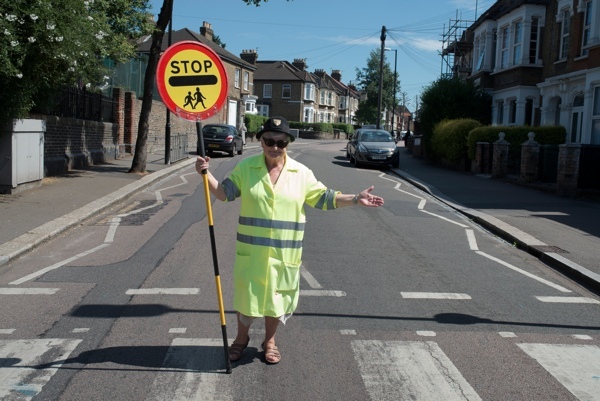 Thank you for telling us about Dee GA. She is certainly one of the unsung heroes of the East End, one of those people who makes our world a better place to live in. Thank you, Dee! Work is the fountain of youth, I do believe. Would a rubber glove, maybe with a strap around the wrist, such as used for washing dishes be a solution to the dampness that is causing your rheumatism?